Vivian Howard’s daughter Flo loves this gooey grilled cheese sandwich with smashed blackberries, but you can use practically any juicy in-season fruit: blueberries, strawberries, peaches, apricots, figs. 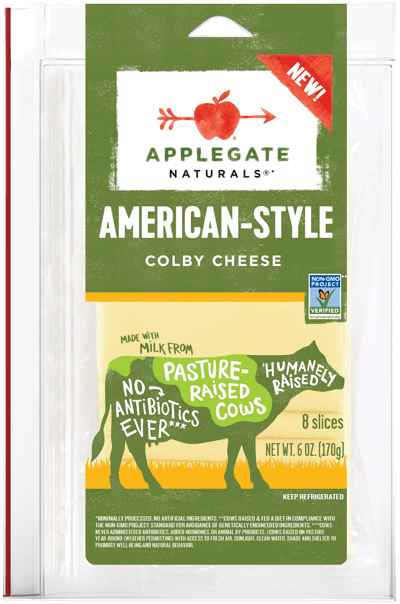 Applegate’s new American-Style Colby cheese pairs beautifully with that jammy sweetness. Using a fork, gently smash the berries so they just start to break open. Preheat a 10-12 inch skillet over low heat. Lay one piece of cheese on two slices bread. Top with the berries. Lay the remaining slices on top of the berries. Top with the last two slices of bread. Melt half the butter in the skillet. Carefully lay the sandwiches in and toast on one side, making sure you gently press down on the bread with a spatula. When the bottom piece of cheese appears to have melted, flip the sandwich, add the butter and toast on that side. Remove the sandwiches from the skillet. Sprinkle with salt. Cut in half and serve.